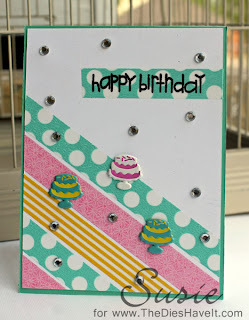 I am in the middle of a love affair with Washi Tape. And let me tell you, I am so excited that they make so many colors that go perfectly with my Eyelet Outlet brads. This card is a great example. My Cake Brads are just perfect with these three tapes. For a bit of sparkle, I added some Eyelet Outlet Clear Jewel Bling too. This card is SOOOOO simple to make. I used a 4x5.25 white panel and added five rows of Washi Tape. At the top I added a small piece of tape to anchor my heat embossed sentiment. Then I added my brads and gems and I was nearly done. All I had left to do was add the panel to a white card base. EASY PEASY!! I hope you like my card today. I'll be right back here tomorrow with another project to share with you.